This appendix summarizes spacecraft attitude systems and serves as a guide to mission specific attitude determination and control literature. The main table is an alphabetical listing of satellites by acronym with pertinent data as available. Subsequent sections list these spacecraft by stabilization method, accuracy requirements, control system, and sensor system. 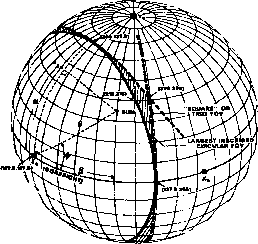 For example, if you are interested in gravity-gradient stabilization in low-Earth orbit, Section I.l lists DODGE, GEOS-3, and RAE-2 as gravity-gradient stabilized. The main table lists GEOS-3 as the only one of these in low-Earth orbit. Normal automated literature search procedures may then be used to obtain available literature citations for GEOS-3. The material in this appendix has been collected from literature searches, the TRW Space Log, and Joseph and Plett . Design values are quoted for upcoming spacecraft, which are denoted by an asterisk after the spacecraft acronym. The superscript "b" is used foT body and "w" is used foT wheel. Missions with mutiple phases (e.g., RAE-2) are listed in all appropriate categories.